Why do companies use live chat? Email and phone numbers are the most frequent communication channels available for customers on eCommerce websites. However, some leading eCommerce websites have decided to favour real-time customer service in an effort to not only improve their first contact resolution, but also reduce the amount of calls they receive. Why did companies decide to implement a real-time customer service solution in the first place? What's the economic impact of offering live chat support? Out of all participants, 26% of respondents had already implemented live chat and 21% planned to do so during the next 12 months. Companies already using live chat had the following objectives: 83% said improving customer experience and increasing conversion rates were their two main priorities. Improving their brand image and building customer loyalty came next as secondary motivations. Increasing the average order value and reducing contact costs were also objectives, although less prevalent. Do they use it before or after the sale? When asked about the stage of the online sales process at which they used live chat, 83% of respondents said they used chat for pre-sales. This is when there is a high attrition rate and the potential to improve the conversion rate is the greatest. However, more than half of respondents said the websites they worked for also deployed live chat during the check out or sign up process; these were mainly large eCommerce websites in the consumer electronics and furniture industries. It is at this stage, the role of the live chat agent is to guide and reassure the customer to complete the purchase. The study found that although live chat is implemented least often in an after-sales context. At this stage, the role of the live chat agent is to guide and reassure the customer in order to increase their chances of completing the purchase. The companies that took part in the study were also asked to consider the factors which they believed were essential for the success of a live chat project. As a result, the factor most mentioned by respondents was the solution adoption by teams and the general process of agents getting used to using the tool. Indeed, companies insisted that if the live chat agents were not involved in the project and trained to use the tool, the project could become counterproductive. Therefore, the skills and training of the live chat teams are considered essential to ensuring the success of a live chat project. The implementation of a behavioural targeting strategy comes next as a key success factor. Defining the rules that determine which visitors will receive a live chat engagement is key to optimising the use of the solution. What is the economic impact of live chat? 74% of participants said that live chat had improved the quality of service and 73% claimed it had improved the conversion rate of products with which live chat had been implemented, a globally positive impact. 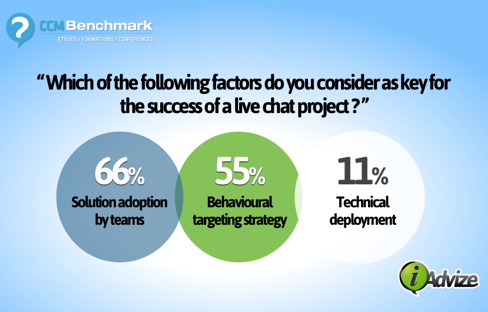 When asked whether their live chat project had been profitable, three quarters replied positively. 47% of participants said that there were still optimisations which they planned to implement to improve the ROI of their live chat solution. 21% said that they expected their live chat solution to be profitable before the end of the year. This study was based on two sources of data: interviews with 62 eCommerce directors in charge of leading ecommerce websites in their industry and an online survey in which 31 online customer service decision makers took part. The companies they worked for included Air France, IKEA, Etam, Best Western, Carrefour, Lastminute and Tui. Miranda Hobbs is UK Communication Manager at iAdvize. The company is specialised in real-time online customer service and provides live chat, click to call and video chat solutions. Combined with a behavioural targeting engine, these tools can increase conversion rates and optimise customer satisfaction and loyalty. Founded in 2010, more than 1000 clients throughout Europe use iAdvize today to improve their real-time online customer service. You can connect with iAdvize on Facebook.